Made in U.S.A. 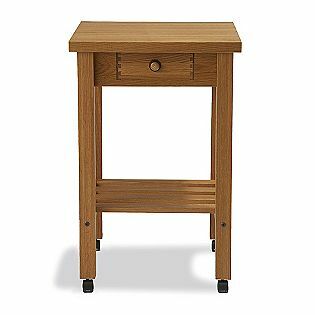 This Oak Kitchen Cart add distinctive style to the kitchen - without sacrificing function. The cart has a 23.5" square cutting board top that can be used for chopping, dicing, meal preparation, cutting bread or, of course, canning. A drawer below the cutting area serves as a convenient place to store knives and other utensils. Caster wheels make this cart extremely mobile so it can be used in the dining room as a serving table of in the living room as a cocktail table. Top quaility craftmanship and finest woods are a signature trait for Snow River.